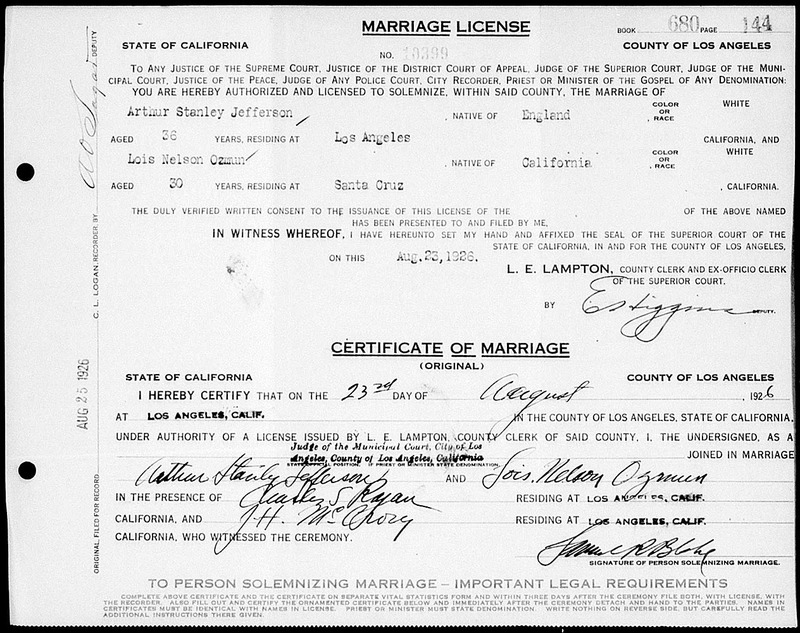 On August 23, 1926 Arthur Stanley Jefferson married Lois Neilson Ozmun, an actress, at a civil ceremony in Los Angeles, California. They both appeared together in Do You Love Your Wife? (1919) and Half A Man (1926). Stan Laurel, being duly sworn deposes that he resides at 3716 So. Van Ness, Los Angeles, California, that he is the author of "A CLOSE SHAVE", an original motion picture story, a copy of which is attached hereto, and that he is entitled to all the rights and benefits accruing therefrom. Know all men by these Presents: That Stan Laurel, the party of the first part, for and in consideration of the sum of Ten Dollars ($10.00) gold coin of the United States of America, to him in hand paid by Hal Roach Studios Inc., the party of the second part, the receipt whereof is hereby acknowledged, does by these presents grant, sell and convey into the said party of the second part, its executors, administrators and assigns, story entitled "A CLOSE SHAVE." To have and to hold the same to the said party of the second part, its executors, administrators and assigns forever. 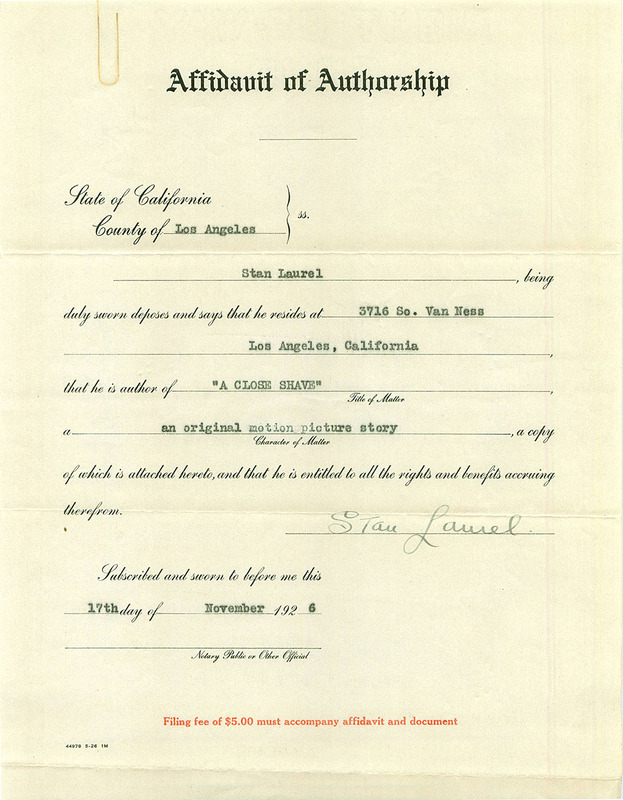 And Stan Laurel does for his heirs, executors and administrators, covenant and agree to and with the said party of the second part, its executors, administrators and assigns, to warrant and defend the title to the said property, goods and chattels hereby conveyed, against the just and lawful claims and demands of all persons whomsoever. Witness my hand and seal this 17th day of November, 1926. FIRST: That the said second party does hereby agree to render services as an actor in motion picture productions and as a writer of stories and scenarios; it being understood that such services, whether as such writer or actor, are to be rendered by the second party in motion picture productions, whether those being produced by the first party or by persons with whom the first party may enter into agreements from time to time for the rendition of services by the second party as aforesaid, such services to be rendered by said second party in any such capacity at the instance and request of the first party, for and during the term of five (5) years, commencing on the 4th day of April, 1927, and ending on the 3d day of April, 1932; it being understood that the second party will faithfully and to the best of his ability perform such services as such actor and writer as aforesaid. SECOND: It is understood that should the production of any film in which the services of said second party are required be in progress at the expiration of the term of this agreement, or any prior termination thereof, the same shall be extended until such film is completed or the work of said second party terminated in a manner satisfactory to the first party, but such extension shall not exceed two (2) weeks, and all the provisions of this agreement in effect at the expiration of said term shall be extended and remain in full force and effect during the extension provided for in this paragraph. It is also understood that should retakes be necessary after the expiration of such term, or after any prior termination, said second party shall and hereby agrees that he will, at the request of the first party, render services of the kind contemplated hereby in producing such retakes, and agrees to accept in full for such services payment for such days as such services are required at the rate of payment in effect hereunder at the termination of this agreement; it being understood, however, that all such retakes shall be completed within two (2) weeks following the termination of this agreement. THIRD: The second party agrees that during the life of this agreement he will devote his entire time and attention exclusively to the services of the first party, and will perform the services above specified, and all services incidental and associated therewith, at such times and places as the first party may from time to time direct; that he will conform to such reasonable rules and regulations as said first party may from time to time prescribe for the conduct of its Studios, and to the regulations of such other Studios in which he may be performing, under the terms hereof, and that he will report for duty promptly when called or directed for work by said first party, as herein contained. FOURTH: Said second party, further, agrees, in consideration of the premises and of the advertising and publicity which he will receive through the release of films produced under the terms hereof, that he, the said second party, will not, during the continuance of this agreement, appear in or assist or participate in producing any motion picture, scenario or film for any motion picture producer, or otherwise, or in any other manner engage in or assist others in any branch of the motion picture business or profession, or appear or in anywise assist in the production of any play, drama or other production upon any stage, or in any public or private performance, lecture or entertainment, or take part in any radio program, broadcast or entertainment except with the written consent of the first party, and the said second party does hereby acknowledge that his talent is unique and of a peculiar and extraordinary nature and character, and of peculiar value to the first party, and that his talents and services cannot be replaced by the first party, whether in its own productions or in such productions of others in which the first party may agree to have the second party act or perform. The second party hereby grants to the first party the privilege of publicity in advertising him in connection with all the pictures in the production of which said second party may take part under the terms here of. FIFTH: It is agreed that the second party shall receive for his services the sum of three hundred dollars ($300.00) per week, commencing on the 4th day of April, 1927, and ending April 3d, 1928; the sum of four hundred dollars ($400.00) per week during the second year hereof; the sum of five hundred dollars ($500.00) per week during the third year hereof; the sum of six hundred fifty dollars ($650.00) per week during the fourth year hereof, and the sum of nine hundred dollars ($900.00) per week during the fifth year hereof; all such payments to be made at the end of each week. In the event, however, that during the period hereof the second party hereto is featured in a series of pictures as the featured star therein, after the commencement of such series of such featured pictures, in lieu of the compensation above set forth, the compensation of the second party shall be based upon the following scale: the sum of four hundred dollars ($400.00) per week during the first year hereof, commencing April 4th, 1927, and ending April 3d, 1928; the sum of six hundred fifty dollars ($650.00) per week during the second year hereof; the sum of nine hundred dollars ($900.00) per week during the third year hereof; the sum of eleven hundred fifty dollars ($1,150.00) per week during the fourth year hereof, and the sum of fourteen hundred dollars ($1,400.00) per week during the fifth year hereof; all such payments to be made at the end of each week; and from and after the commencement of such featured series starring the second party hereto, the compensation shall be during the remainder of the period hereof, according to the second scale of compensation, but shall have no effect upon compensation paid theretofore. SIXTH: As a distinct and additional consideration to the second party for granting to the first party the exclusive and sole right to his services during the term of this agreement, and also as a special consideration from the first party for the privilege to the first party of terminating the employment of the second party upon notice as hereinafter provided, the first party agrees to pay to the second party, at the end of each week during the term hereof, the sum of one hundred dollars ($100.00) per week, as additional compensation. SEVENTH: Said second. party, further, agrees that if, at any time, by reason of any strike, fire, act of God, or other cause beyond the control of the first party, it shall be prevented from carrying on the work of producing films in connection with the production of which the services of said second party are required, or if at any time or times during the life of this contract, the said first party shall determine to suspend the making of any such films for a period of not to exceed one (1) month during any one year, the said first party shall be released from payment of the aforesaid compensation or any part thereof (except the separate and special compensation provided in Paragraph Sixth hereof) during the continuance of such suspension or interruption of work. EIGHTH: In the event that, by reason of sickness or accident, the second party shall become incapacitated from performing the terms of this agreement for a period longer than two (2) days at any one time, thereupon the same shall be suspended, both as to services and compensation (other than the separate and special compensation provided in Paragraph Sixth hereof) until said second party shall have recovered. NINTH: Should the first party at any time desire to terminate the employment of the second party under this agreement, it is provided that the first party, having theretofore paid the special weekly compensation to enable it to terminate this agreement, shall have and is hereby given the privilege of terminating this agreement and the employment thereunder at any time upon its first giving to the second party sixty (60) days' notice of its intention to so terminate this agreement; and on the expiration of the time specified in said notice, this agreement and the employment thereunder and all compensation, of whatever nature, shall terminate and cease. TENTH: The first party, further, in consideration of the faithful performance by the second. party of the terms and obligations of this contract, agrees to account for and pay to the second party, where said second party has been performing service for others at the instance of the first party, one-half (1/2) of the excess actually received by the first party for the services of the second party for such services to others over and above any and all amounts paid him by the first party during the period of such services and during the suspension of his services to the first party necessitated by such engagement or during any lay-off period prior thereto. ELEVENTH: It is understood ti1at any scenarios, stories or material written or composed by the second party hereto shall be original material, and that the option of the first party hereto it may be copyrighted, or priority thereof set forth by it either under the laws of the State of California or the laws of the United States of America relating to such matters, under its own name or under the name of the second party hereto, who, however, shall execute such transfers and assignments thereof to the first party as such first party shall from time to time deem advisable, but that from time to time, at the request of the second party, the first party shall re-assign to the second party hereto all rights therein not necessary in the use or preservation thereof as motion picture theme or material in the production of motion pictures or uses incident thereto. IN WITNESS WHEREOF, the first party has caused its corporate name and seal to be hereunto affixed by its officers hereunto duly authorized, and the said second party has hereunto set his hand, the day and year first above written. It is understood that it is the intention of the parties hereto that the services of the second party is a writer of stories and scenarios are to be rendered only for said pictures in which second party is to appear. 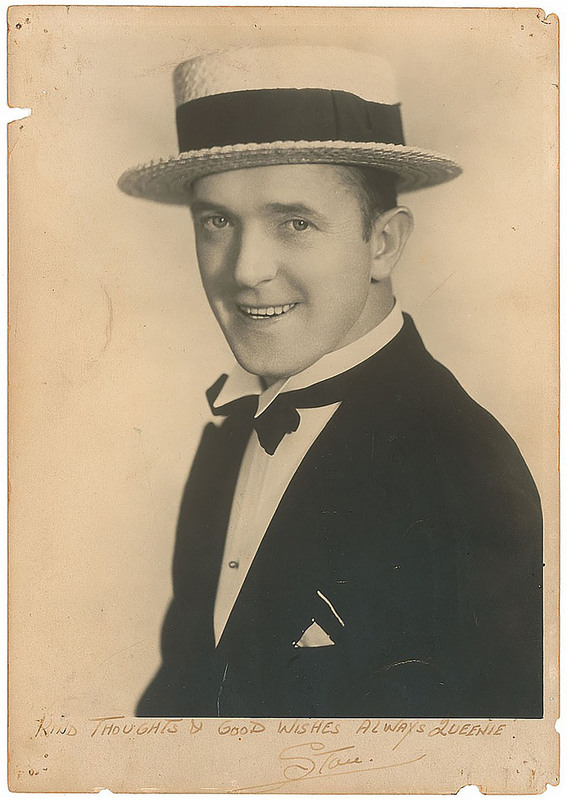 This will confirm our agreement that the undersigned, STAN LAUREL, will appear in that certain picture entitled "PICK A STAR", including appearance and added scenes, sound tracks, process shots, transparencies, trick shots, trailers, changes or foreign versions, as may be necessary; also as to any still or publicity pictures that may be desirable for the exploitation of the picture. You shall have full title to and ownership of the picture and any sound in connection therewith and all copyrights applicable thereto. I shall receive the sum of $10,000.00 for all of my appearances and work in connection with the picture. “Queenie” was Fred Karno Sr.’s daughter-in-law. But she and Fred Jr. (Freddie) had divorced in 1924—hence the formal tone in the letter. 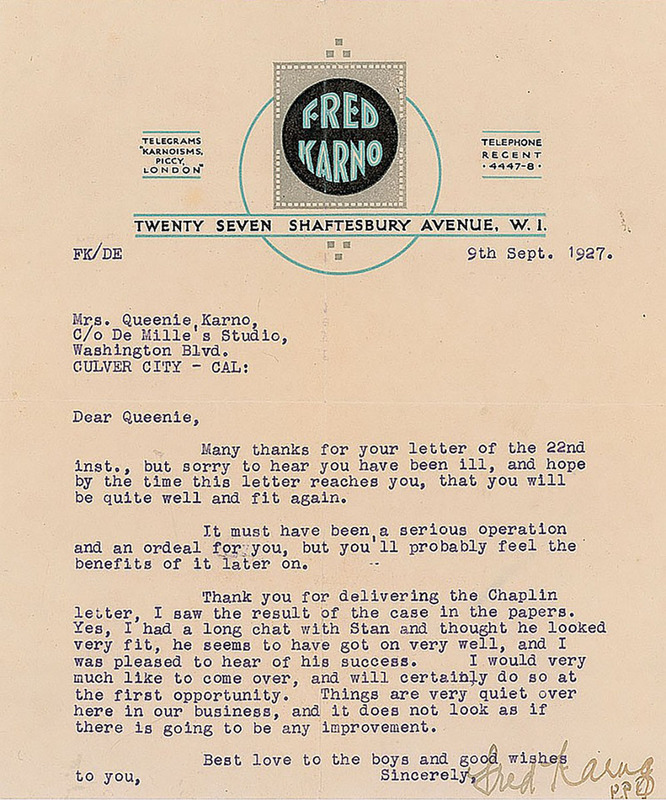 If you’re wondering how Karno Sr. managed to have a good talk with Laurel, when he himself was in London, that’s because just four weeks earlier Stan had spent a few days in London, where he had taken advantage of the Roach Studios summer break, to go and visit his father, in Ealing—just eleven miles from Karno’s Fun Factory in Camberwell. I have already completed another picture since my return called “Hats Off.” I’m sure you will enjoy this one when you see it. Yours of August 30th. to hand with encl. photo of yourself. Very many thanks. Note you had just returned from your vacation, trust you had a real good time. I had a wonderful trip to Europe only did'nt have enough time to spend there as I should have liked. My Home is in England - had'nt seen my folks for over 16 years, sop you can imagine I got quite a kick out of it. I flew over from London to Paris & enjoyed the trip immensely. I have already completed another picture since my return, called "HATS OFF" I'm sure you will enjoy this one when you see it. Glad you saw the Priscilla Dean picture also "why Girls Love Sailors" & that you liked them. Here is a list of my latest ones you can look out for;- "GET 'EM YOUNG" "ON THE FRONT PAGE" "EVE'S LOVE LETTERS" "DO DETECTIVES THINK" "WITH LOVE & HISSES" "SAILORS BEWARE" "DUCK SOUP" "LOVE 'EM & WEEP" "FLYING ELEPHANTS" "COWBYS CRY FOR IT" Released thru Metro-Goldwyn-Mayer;- "SUGAR DADDIES" "THE SECOND HUNDRED YEARS" "HATS OFF". 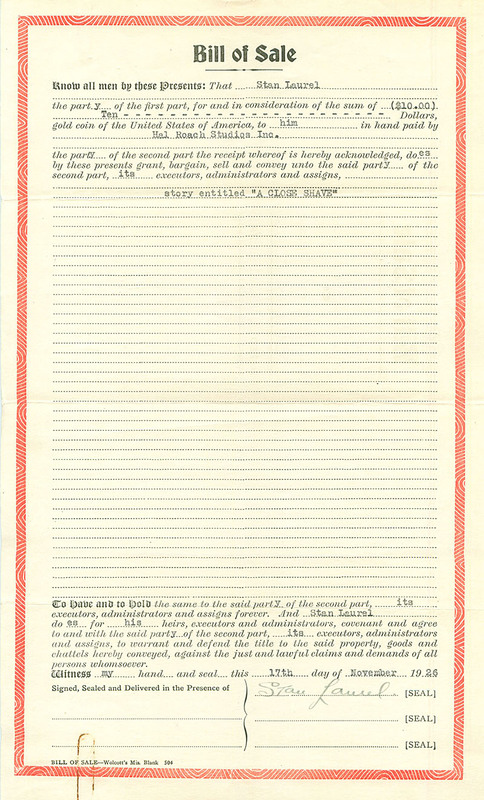 In accordance with our telephone conversation of Monday, October 10th, 1927, it was agreed that effective Monday, October 10th, 1927 the different and higher compensation provided for in the contract in existence between yourself and this corporation, dated November 29th, 1926, and contained in Paragraph Fifth thereof, shall become effective, and being the sums to be paid to you as compensation in the event you are featured in a series of pictures. To provide a record of the effective date will you kindly indicate your receipt and acceptance hereof upon the space provided below, and return one of the copies for our files. I am returning herewith the twenty five cents you enclosed, as the amount of my fan mail doesn’t warrant any charges. Just a line to thank you for your very sweet letter, which is greatly appreciated. I am mailing you under separate cover a photograph per your request. Trust you will receive same alright. I am returning herewith the Twenty Five Cents you enclosed, as the amount of my Fan Mail does'nt warrant any charges. I was born in Elmira, New York on January 14, 1892. 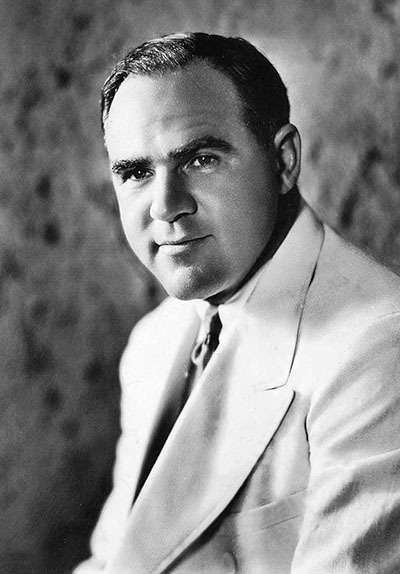 In about 1914, I founded and became the owner of Hal Roach Studios, which became a major film producer in the Hollywood, California area. These studios became famous for their comedy productions. From the days I opened my own studio in this silent film era, I endeavored to get away from the limited traditions of comic producers such as Mack Sennett and establish plots and formats instead of gags. Although I owned and controlled the rapidly expanding studios, I personally participated in the actual productions, either as author, creator, director and producer in every production, and sometimes in all capacities; in every case, I supervised all activities. The first time I intentionally cast Stan Laurel and “Babe” Hardy together was in a short subject in my “All Star Series” entitled “Slipping Wives.” In the next 6 or 7 silent shorts, I pitted these two actors against each other experimentally, and gradually and carefully built their relationship as a team. By trial and error, shooting and reshooting, story conferences, brain sessions, and other hard work, I, together with various of my other employee-associates, created, evolved and perfected the characteristics, mannerisms, dress, postures, gestures, grimaces, etc. that formed the whimsical atmosphere in which these two actors could frolic under my direction. They clicked with the public, as I knew and planned that they would. The atmosphere became familiar to the public, which anticipated with eagerness in every comedy the appearance and reappearance of the now familiar identifications, such as: the seedy but strictly formal clothes; the soiled wing collars and string ties; the somewhat shabby derby hats; Hardy’s tie-twiddle, and serious, frustrated look directly into the camera, his expressions of a “fine mess”; his rotating a middle finger before him before making a “smart” decision; his rising “OH-OH-OH” when matters became too much for him; Stan’s bursting into tears at his dilemmas; his scratching his tousled topknot; his usual subservience to Hardy’s bullying, occasionally turning into physical retaliation; his vacuous credulity, etc. By repeating these appearances and mannerisms and building the thin-fat, leader-follower, aggressive-nonaggressive relationships, I thus created backdrops for the plots of each comedy. As audiences around the country became familiar with those backdrops, they gleefully anticipated their appearances and, on their appearances, laughed and enjoyed them as one would enjoy familiar friends. Hal Roach Studio’s first film in which Stan and Babe were billed together as stars was “Putting Pants on Philip,” directed by Leo McCarey from a story I had written, and this MGM release was an immediate success to be followed by our memorable “Battle of the Century” which I had written for the boys. I authorized bigger production budgets and hired top writers and directors, and the characters and plots were molded into a distinctive format and pattern. These were now called “Laurel and Hardy Comedies” by the trade, and theaters plugged them as Laurel and Hardy instead of the usual 2-reel comedy “All Star Series” that accompanied features in theaters as part of the regular program. Through the years, the Hal Roach Studios spent millions of dollars in producing and exploiting our Studio’s format on films and they became famous and revered throughout the world by both peasants and kings. 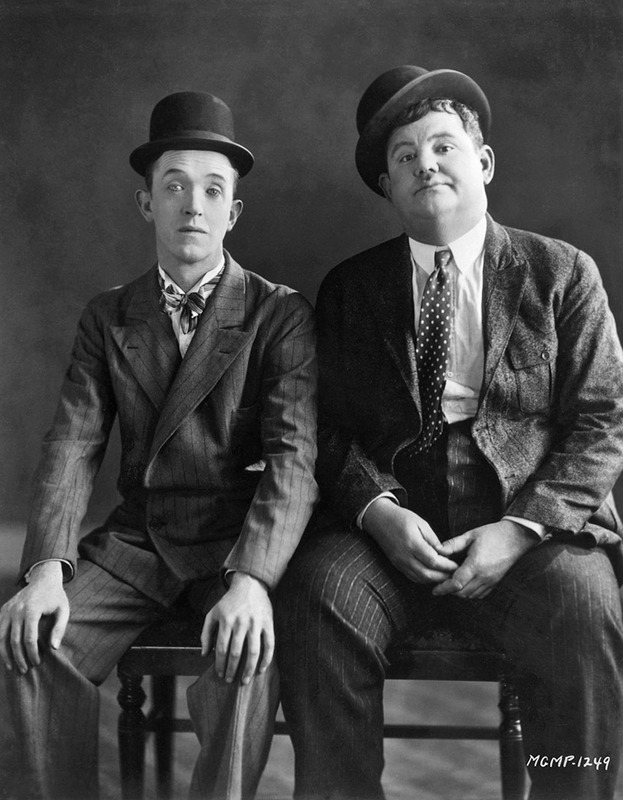 Their names and likenesses were used by the Hal Roach Studios in all sorts of publications and for toys, games and clothing, and the name and pattern of Laurel and Hardy became a vested and important item of commercial value. The famous Walt Disney was permitted by me to characterize them in a number of Disney’s own famous cartoons, and the major studios such as RKO and MGM, etc. asked and received permission from us for Laurel and Hardy to appear with our comedy routines in many feature pictures other than Hal Roach Studios Productions. 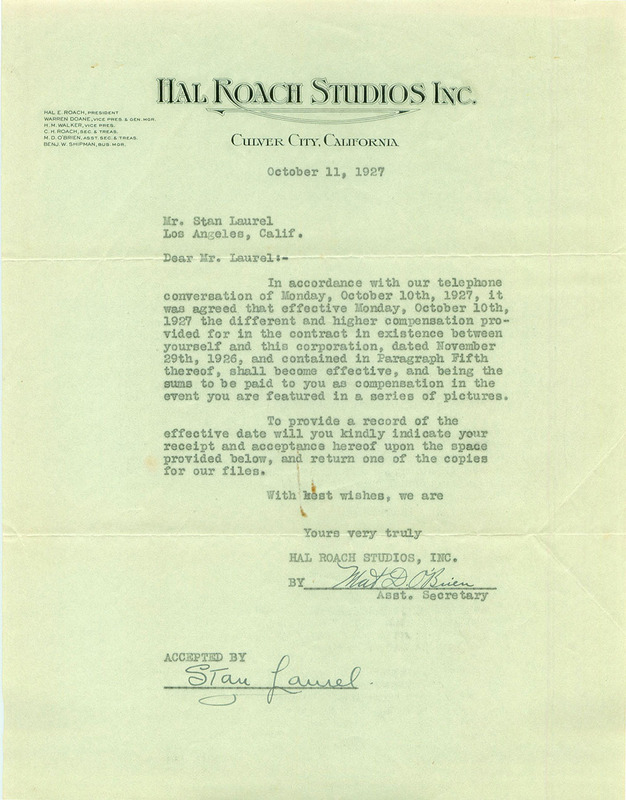 Hal Roach Studios, Inc., the Delaware corporation, has succeeded to my rights in the Laurel & Hardy films and I am currently acting as consultant to that firm.